Did you miss out on the ballot? If so,and you want to ride, see letter below received from Sense, the National Deafblind charity. I work in the Events team at Sense, the National Deafblind charity, and I wanted to get in touch as we have guaranteed places available on our team for Prudential RideLondon-Surrey 100 on Sunday 2nd August and we’d love for the members of West Surrey CTC to get involved. No doubt you are already aware of this event, which takes riders 100 miles on closed roads through central London and into the beautiful Surrey countryside, tackling the iconic Leith Hill and Box Hill along the way. It’s hugely popular and is always over-subscribed; this year around 25,000 riders are expected the cross the line. We appreciate that riding for a charity and fundraising can sometimes be a sticking point, particularly among club riders who frequently miss out on places via the public ballot. Therefore, we have carefully calculated the costs involved and have managed to bring our general sponsorship target down to £489. 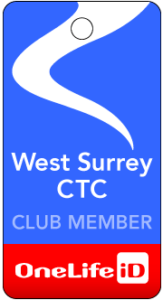 For the members of West Surrey CTC we are happy to bring this down even further to just £450! To secure your place, you just need to visit our website and pay a registration fee of £20 (referencing your club name on the application form). or on 0300 330 9257.